SEE YA, STOCKTON: Tonight marks the final of eight meetings with the Heat this season, and the fourth of four scheduled visits to Stockton Arena. 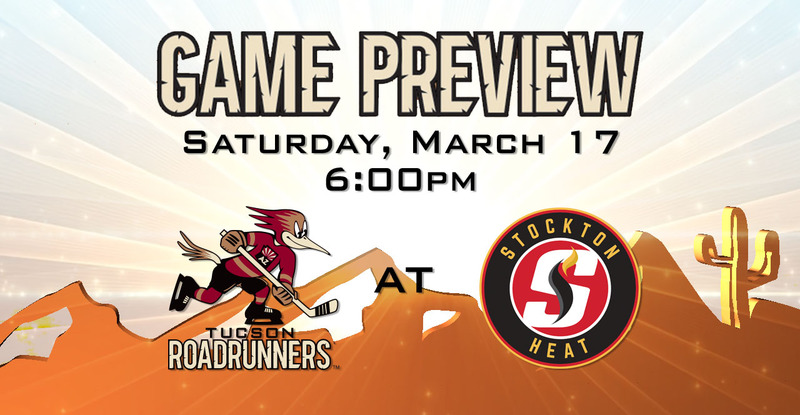 The Roadrunners are playing the final of a three-game road trip; the Heat are playing the final of a four-game home stand. 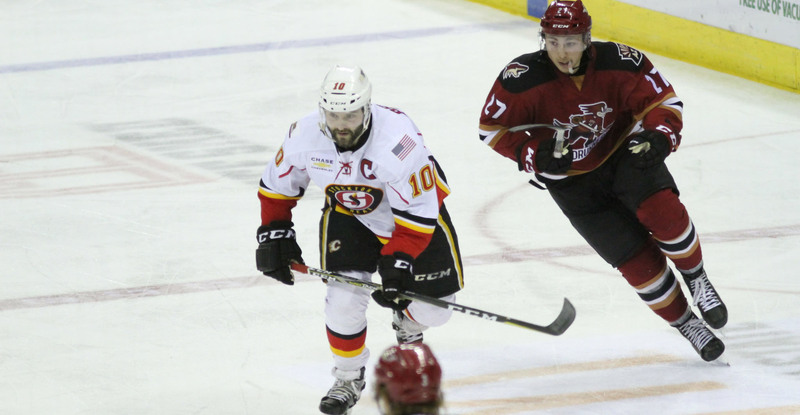 Both teams are coming off of a meeting Friday night in which the Roadrunners won, 3-0. A CAREER YEAR: With two more goals scored Friday night, Mike Sislo upped his season point total to 42, which is now officially the second-highest of his eight-year pro career. Sislo registered 53 points in 57 games with the Albany Devils during the 2015-16 campaign, his single-season high. With 22 goals now this season, Sislo is tied with Dylan Strome for the team lead in that department. ROAD POWER: Having converted on two of their four power plays Friday night, the Roadrunners only improved the numbers that boast their road power play as the league’s best. In 122 man advantage opportunities in opposing buildings this season, the Roadrunners have capitalized on 30 of them, translating into a 24.6% success rate. PROJECTED LINEUP: The team held an optional morning skate at Stockton Arena ahead of tonight’s game. Per club policy, specifics regarding the team’s lineup will not be published until 4:00 PM this evening. WHO’S HOT? : Mario Kempe enters the night with 10 points in the last seven games, Carter Camper has a total of 12 points in his six games with the Roadrunners, and Mike Sislo has goals in four consecutive games and points in 12 of the last 15 games. THE LAST TIME AROUND: In the teams’ previous meeting Friday night at Stockton Arena, the Roadrunners topped the Heat by a 3-0 score. Mike Sislo scored the team’s first two goals; Mario Kempe netted the third. Carter Camper assisted on all three Roadrunners goals. Hunter Miska turned away all 23 shots he faced, earning his first professional shutout. A MILESTONE FOR HANLEY: Should he be in tonight’s lineup, defenseman Joel Hanley will be playing in his 250th American Hockey League game. He has totaled 74 points (9G, 65A) in 249 league games to date. Hanley has played in 78 games with the Portland Pirates, 129 games with the St. John’s Ice Caps, and 42 with the Roadrunners. PLAYOFF PUSH: The Roadrunners enter the evening having the second-lowest magic number (17) in the Western Conference. Due to last night’s defeat, the Heat have been momentarily pushed out of playoff positioning. Stockton enters the night with a .571 points percentage, right behind the Texas Stars’ .578 points percentage. Texas currently holds the fourth and final postseason spot. WE’RE DOING IT LIVE: You can catch tonight’s action on AHL Live. Roadrunners play-by-play broadcaster Tom Callahan will have the radio call on AM 1450 Fox Sports Tucson. Radio coverage begins at 5:45 PM.